Captivating could-be-happening-now science-fiction plot with appealing artwork. There is a real tradition of former presidents leaving a personal note for the new president. In Letter 44 Vol 1, the note says aliens are building a mysterious object in our solar system. No one except for a few top defense staff have been told to avoid mass panic. The note continues that the seemingly senseless middle east wars were started just to keep our soldiers in tip-top condition and to inflate the defense budget. Because of a mysterious transmission obstruction, our cameras and telescopes can’t see what is being built. A ship is hastily constructed in secret and sent with 9 military/scientists to investigate. The ship is scheduled to arrive in a few days after more than 3 years in flight. Will the new President reveal the secret to the American people? To the other national leaders? What will the ship’s crew discover when they reach the alien object? What is its purpose? The premise and art are great. The plot has several twists and turns. It’s hard to judge who is good and who is evil. 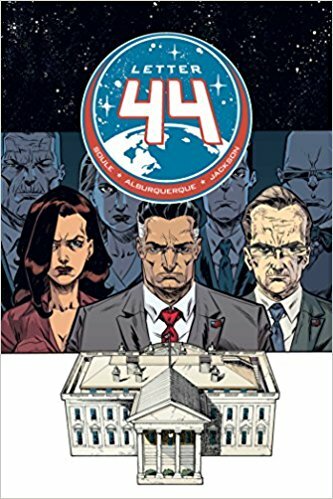 If you like your science fiction to be thought-provoking, you can’t go wrong with Letter 44 Vol 1. Plus it’s available for free on Comixology Unlimited and Prime Reading at the time of this review. 5 stars!